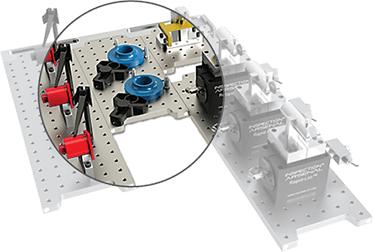 September 1, 2016 – Phillips Precision, Inc. of Boylston, MA now offers an enhancement to their traditional stand-off fixture components with rotating height adjusters. New to the line of quick-action, non-marring Inspection Arsenal™ work holding is a set of adjustable and rotating stand-offs and knuckles. The kit includes 2 each ½ and ¾” stand-offs, 2 each adjustable stand-offs in 1/2” and ¾” diameter, 2 non-marring plastic cones, 2 rotating knuckles, and 2 plastic adjusters with thumb screws. This set can be used to fixture those tricky surfaced parts and to enable holding in just the right location at just the right angle. The rotating knuckles in combination with the plastic cones can also be used as a horizontal non-marring locating stop. The adjustable standoff is used like a jack and can be used for fine height adjustment of parts that are not completely flat on the bottom or may have a step that you need to rest on in order to have 3 points of contact. The plastic height adjusters maximize the rotation and height of the rotating knuckles, enabling you to have a standoff that faces in any direction above the rotational center line. All components work with the traditional stand-off set, magnetic set, and most all other Inspection Arsenal™ clamps and components. Inspection Arsenal™ offers a variety of unique and affordable work holding components that are non-marring, trigger-action, low-profile, and interconnecting. This work holding is a perfect complement to the LEAN concept Loc-N-Load™ quick-swap fixture plate system. Phillips Precision, Inc. is a full service machine shop and manufacturer of unique work holding solutions. Visit www.fixture-up.com to see the full Inspection Arsenal™ product line including demo videos and case studies.